Mindfulness Meditation has the capacity for us to maximize our potential to be aware of the present moment. This simple and profound practice has been utilized for over 2500 years. Meditation is a learned skill that allows the individual to pay attention to present moment experiences with clarity of openness, curiosity, and investigation to be with what arises. During this last decade significant medical research has shown Mindfulness Meditation to increase attention and focus, fostering wellbeing, and lessen emotional reactivity. Shakyamuni Buddha with offerings, Kachoe Dechen Ling, California, USA. Photo by Chris Majors. Participants will explore the practice of developing clarity of attention that allows grasping, judgment, and fear to fall away. This practice can lead to the cultivation of qualities such as compassion, equanimity, wisdom, and joy. There will be instructions for sitting meditation, and walking meditation. We will have time for sharing, community, questions and answers. This retreat is appropriate for beginners as well as experienced meditators. Venerable Jampa Sangmo is a Tibetan Buddhist Nun. She was born in Hermosa Beach, California. In 1966 she was first introduced to meditation at the University of California at Los Angeles when Maharishi Mahesh Yogi was invited to give a lecture. Her interest in meditation led her to the exploration of Zen where she studied with Thich Nhat Hanh. She has also done numerous long Vipassana retreats. She came to Tibetan Buddhism in 1993 and began her studies with several Buddhist Masters including Lama Zopa Rinpoche, H.E. Choden Rinpoche, Ribur Rinpoche and His Holiness the Dalai Lama. She took robes with her teacher Khensur Jampa Tegchok Rinpoche in 2008. 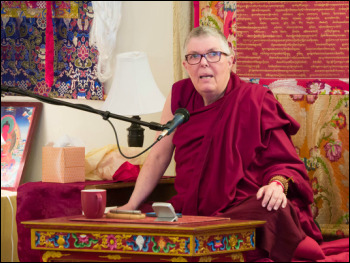 She has lead meditation groups and retreats for Chevron International, Road Scholar (formally Elder Hostel), Spirit Rock Meditation Center, Land of Medicine Buddha (LMB) and Vajrapani Institute. She facilitated a Cancer Support Group for four years at LMB. Most recently she was invited by Facebook to speak about Meditation at their Menlo Park Campus. Jampa Sangmo understands the stresses of work life and how to incorporate mindfulness to optimize one's happiness and effectiveness in the workplace. Before becoming a Nun she worked as an analyst and consultant in government and the private sector. She developed several programs that increased organizational efficiencies and provided innovative and creative solutions to problems in the workplace. Venerable Jampa Sangmo currently resides in Santa Cruz and teaches meditation classes at Ocean of Compassion in Campbell, California. She is passionate about teaching meditation and how to incorporated it in everyday life.